We have all heard "that word" and what it signifies, horror, fear and shock. Death and destruction in its wake. I have never experienced a large one, only three minor events. The first was in England in 1945, I fell off my bed in the early morning, and wondered why. At noon that day, on the radio, we heard it had been an earthquake. The second and third were here on Vancouver Island, one in 1997, at 8 a.m. one day, and it sounded like a train. The third was a year or two later, about supper time and again sounded like a train, right next door. When Ron and I were in California in 1987 we saw the boarded supports of bridges and buildings, from the North Ridge quake the year before. It was a bad one there. The whole west coast is quake prone. Officials tell us (just last night on TV,) "Get ready with a survival kit, in the next 2 weeks, for a quake. Indications are perfect for it." Very few, if they have a kit, will have it nearby to grab, so why bother? Quakes strike without a warning, so I for one will stay put and take my chances. One idea that has merit is to put some quarters in the pockets of what you are wearing, it's easy and safe and will be there to make very important phone calls if you are lucky. It is a matter of luck and prayers. I too have experienced a number of minor earthquakes while living on the west coast of North America. Mom's idea of keeping quarters in pockets for phone calls is innocent for its time, even, assuming phone lines would not be broken, and nowadays, there are very few if any pay phones left. So many devastating earthquakes around the world (Haiti, Japan, Turkey to name but a few) leave me saddened for the victims. 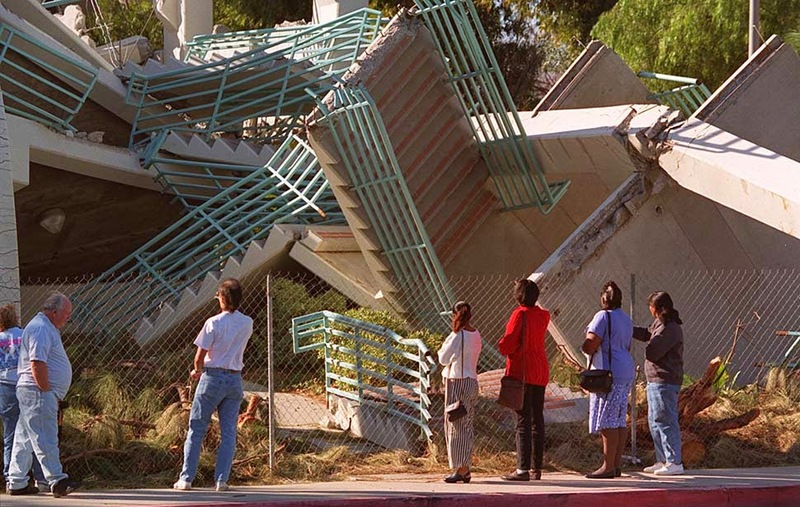 After the Northridge quake, pictured above, California required buildings and freeways to be retrofitted so they could withstand future quakes.